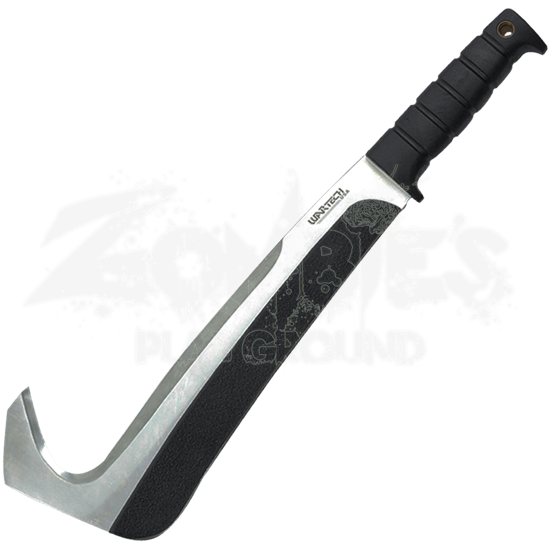 The Dual Colored Hawkbill Machete proves useful for ripping through grass, tearing down vines, and clearing other vegetation. The hooked blade is sharpened on both edges and along the inner curve, perfect for swift, efficient cuts. This survival tool is sure to impress with both its utility and distinctive appearance. While the upper portion of the blade possesses the shiny gleam of stainless steel, a black finish covers the lower half. It matches the ribbed handle that enhances the grip. A nylon sheath is included for easy storage and carry.